The Conference also will present a Pitch Slam and Financing Fair that will shine a spotlight on some of the region’s most promising Good Food entrepreneurs. FamilyFarmed’s four-year-old Good Food Accelerator, an intensive entrepreneur development program, plays a central role in the Good Food Financing & Innovation Conference. Combined, the Conference and Accelerator have generated more than $50 million in Good Food financing deals. Early bird discount tickets for the Good Food Financing & Innovation Conference are on sale through Thursday, May 31 at goodfoodfinancing.org. Deadline alert! Entrepreneurs seeking to be part of the Pitch Slam must apply by TOMORROW (Wednesday, May 23). Financing Fair applications are open until Tuesday, May 29: Applications for entrepreneurs and for lenders/funders/service providers (https://www.f6s.com/2018goodfoodfinancingfairfunders/apply) also can be accessed at the Conference website. The event will kick off at 9 a.m. on June 19 with an introduction featuring Betsy Ziegler, the recently named CEO of Chicago’s 1871 business incubator, and Linda Darragh, executive director of the Levy Institute for Entrepreneurial Practice at Northwestern University’s Kellogg School of Management, with FamilyFarmed CEO Jim Slama and Board Chairman Charlotte Flinn. This will be followed by two segments featuring John Foraker, a pioneer of organic packaged food products, who formerly was founder and CEO of Annie’s Homegrown — sold to General Mills in 2014 for $820 million — and now is CEO of Once Upon a Farm, an organic, fresh baby food company, in which actress Jennifer Garner is chief brand officer. Foraker will deliver the Conference’s keynote address. He then will engage in a “Fireside Chat” with Carlotta Mast, senior vice president for content and insights at New Hope Network, whose annual events — the Natural Products Expos (West and East) and the Esca Bona thought leadership conference — are huge national gatherings for the natural and organic products industry. 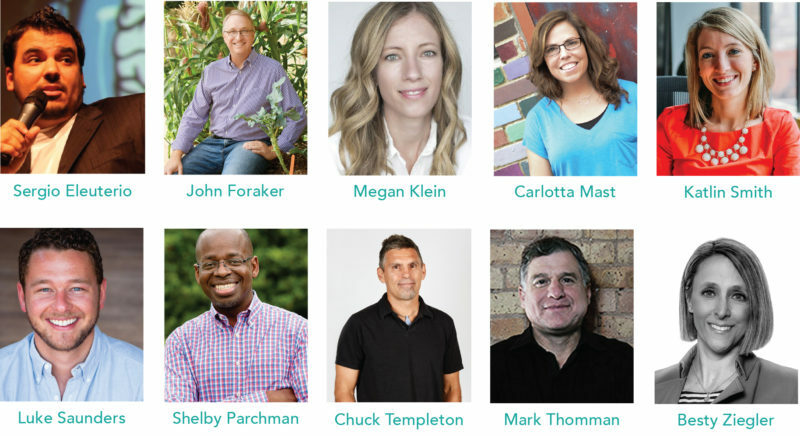 Those pictured here are only a portion of the industry-leading lineup participating in FamilyFarmed’s Good Food Financing & Innovation Conference, June 19 in Chicago. From left to right: (Top Row) Sergio Eleuterio, Springboard Brands; John Foraker, Once Upon A Farm; Megan Klein, Here; Carlotta Mast, New Hope Network; Katlin Smith, Simple Mills. (Bottom row) Luke Saunders, Farmer’s Fridge; Shelby Parchman, InUrban Strategies and FamilyFarmed’s Good Food Accelerator; Chuck Templeton, S2G Ventures; Mark Thomann, Spiral Sun Ventures; Betsy Ziegler, 1871 Chicago. • Big Food + Good Food: Building Strategic Partnerships. 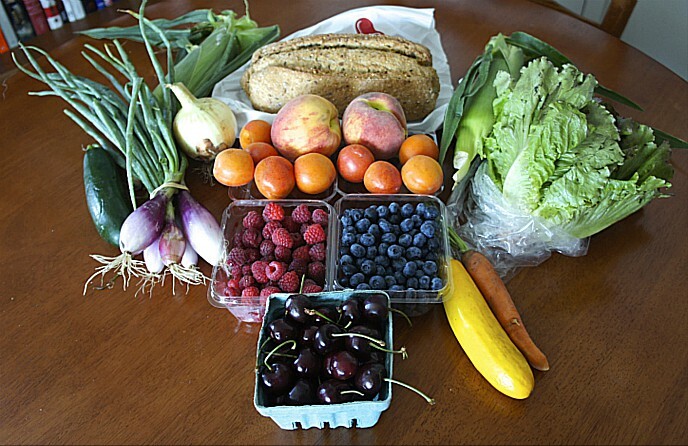 The increased interest of major food corporations in purchasing rising Good Food companies is a recognition of the fast-growing demand and market share for the new wave of healthy products produced sustainably, humanely and fairly. Panelists include Glenn Pappalardo of RXBAR (recently bought by Kellogg Company); Joel Warady of Enjoy Life Foods (now part of Mondelez International); Reese Schroeder of Tyson New Ventures; and Sergio Eleuterio of Springboard Brands (the new business incubator created by Kraft Heinz). The panel is moderated by Andy Whitman, CEO of 2x Consumer Products Growth Partners. 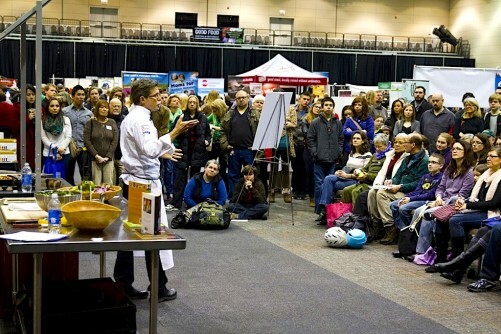 • Chicago + Boulder: Advancing the Impact of Good Food. Chicago is a well-established hub for Good Food movement activity, but those of us who are involved are always striving for our hometown to have even more national impact. This has led to planning for the establishment of a Naturally Chicago organization that will be modeled after Naturally Boulder and its successes in the Western United States. Panelists include Tony Olson of SPINS, Brandon Barnholt of KeHE Distributors, Bill Weiland of Presence Marketing, and Jim Slama of FamilyFarmed. Moderator Carlotta Mast of New Hope Network (participating earlier in the Fireside Chat with John Foraker) also is board president of Naturally Boulder. Participants in the Conference’s exciting Pitch Slam and Financing Fair will be announced in late May. This entry was posted in Uncategorized and tagged 1871 Chicago, 2X Consumer Products Growth Partners, A.T. Kearney, Andrew Bluestein, Andy Whitman, Annie's Homegrown, Barilla, Betsy Ziegler, Bill Weiland, Bluestein Associates, Brandon Barnholt, Carlotta Mast, Charlotte Flinn, Chuck Templeton, CIBC Bank USA, Dave Donnan, Enjoy Life Foods, FamilyFarmed, Farmer's Fridge, General Mills, Glenn Pappalardo, Good Food Accelerator, Good Food Financing &Innovation Conference, Here Chicago, Hyde Park Angels, Impact Engine, Jean-Pierre Comte, Jennifer Garner, Jim Parsell, Jim Slama, Joel Warady, John Foraker, Katlin Smith, KeHe, Kellogg Corporation, Kellogg School of Management, Kraft Heinz, Lauren Rosenthal, Linda Darragh, Luke Saunders, Marianne Markowitz, Mark Thomann, Megan Klein, Mondelez International, New Hope Network, Northwestern University, Once Upon a Farm, OwlTing USA, Peter Wilkins, Presence Marketing, RXBAR, S2G, Seed 2 Growth Ventures, Sergio Eleuterio, Simple Mills, SPINS, Spiral Sun Ventures, Springboard Brands, Sustainable Local Food Investment Group (SLoFIG), Tony Olson. Bookmark the permalink.